The Bonnie 5: what's up? heheheh - so cute. Makes me happy. Great shot Karli! Really captured her environment well. Love this shot... captures a moment! All of that pink is so lovely and foreign to me! You surely captured TT in her element! oh, what a great moment you captured! Love the pink tones! TT is so cute as usual! I'm loving all the pink. And that owl picture on the floor- LOVE!!! 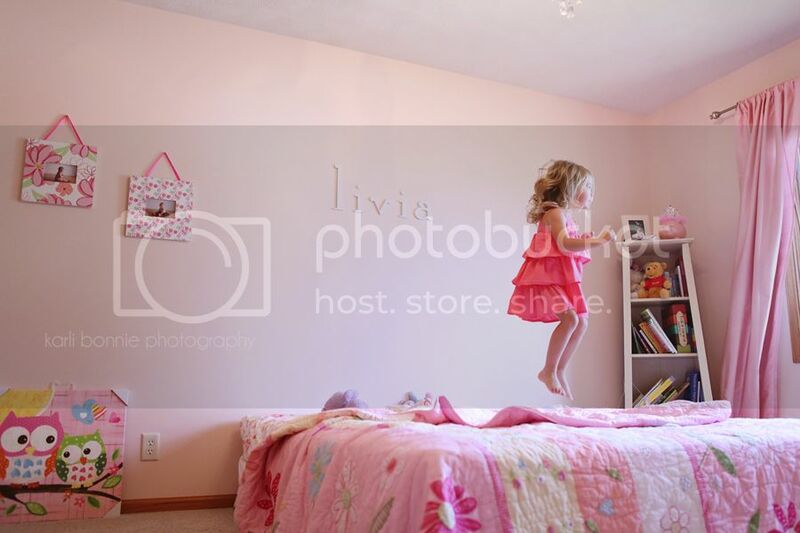 What a darling in the moment shot that captures the fun and freedom of being young and spirited. LOVE the color of this shot. oh my word - ADORE this shot of her! my TT is home with 101.5 fever again! UGH! This is a really fun picture! just wondering if you caught her in action (great catch) or Karli staged it? Loving all the pink! Remember, I had boys. Oh the joys and innocence of being a little girl. Look at all that pink! What a sweetie! So cute! Is that a big girl bed I see? I think the last time you posted a picture taken in her room there was a crib. Aww. I love it. She is so cute and I love her room. Oh my goodness!!! I ADORE this!! Makes me want to be a kid again! The simple joys of being able to jump on the bed!! Love this capture of her! perfect moment! I love this shot! The framing is fantastic! this shot is so perfect! And I love her name floating on the wall. AND I love that owl print. Great choice! I love her room especially those little owls :-)! BIG GIRL BED! You *know* I love a good jump shot! Darling comforter Karli! Love it! I secretly wish my bedroom looked like that! Think I can convince the hubs? Oh my goodness, I am so FAR behind in posts! This is my first in playing catch up! Wow, Wow, Wow! First of all, I LOVE LOVE LOVE Livia's room! And this shot?! Love it! You, my dear, ARE the master of light!!!!!! !